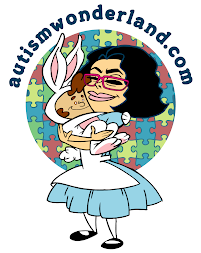 AutismWonderland: And Summer Vacation Starts...NOW! When The Boy first started Early Intervention back in June 2008, we put summer fun on hold. Too much time had been wasted. That summer there was no vacation. No lazy days at the beach. No picnics or BBQs. We lived and breathed ABA and other therapies. 15 hours a week of ABA therapy. 1.5 hours of speech therapy. 1.5 hours of occupational therapy. Monday through Friday, we had a therapist in our home. As for our weekends - we ran errands, cleaned, did laundry and we worked with The Boy. The Husband and I watched the therapists closely during the week so that we could be the The Boy's therapists on the weekends. When September came, The Boy started an Early Intervention half day school program. The Boy was 2 years and 8 months old, still in diapers and speaking only 3 words and I put him on a school bus. He came home and a few hours later a therapist would knock on our door. Instead of 15 hours of ABA at home, it was reduced to 10. Home based speech and occupational therapy remained the same. For the next two years, The Boy was in a full day program but still I fought for home services (8 hours a week). And on the afternoons when he didn't have home therapist, I took him to a sensory gym for occupational therapy. And then he started a new school for Kindergarten. And it was a tough year. He had a long day of school and then he'd come home, have a quick snack and work with an ABA therapist. For the last four years, we've had a therapist in our home five days a week. For the last four years, The Boy has been in school year round. He wakes at 6 am, 5 days a week and is rushed through his morning routine so that we don't miss the school bus. The Boy has not had an entire summer off in four years. The Boy is one of hardest working 6 year olds I know. And if anyone deserves two months of fun - it's The Boy. But he'll have to settle for three weeks. Today is The Boy's first day of summer vacation. So he'll get to enjoy the last three weeks of August. For the next three weeks, there will be no bus to rush for. For the next three weeks The Boy can wake when he wants. For the next three weeks, The Boy will be completely off his routine (sort of). In the afternoons, his therapists will still come over for a few hours. And they will work with The Boy. The therapists will do the things The Husband and I cannot. They will make sure that he will not regress and lose the skills he's acquired over the year. I will take of laundry and cooking and cleaning during the week. So that when the weekends come, we can head to the beach or pool or go where ever The Boy wants to go. I just want him to have fun. We have three weeks of summer vacation. And we have some catching up to do.